Life is the Soul’s Journey; An Experience like no other. An Experience that transcends lifetimes. Words aren’t enough to discuss the Power of your Soul; the very essence of your raison d'être. It is believed that our Soul is the perpetrator of our life; it is the beautiful medium of experiencing life; and the solitary source of the experience that we offer to this world. Your Body empowers you, Your Mind enables you, Your Heart engages you, but Your Soul enriches you, as well as the world-with a beautiful experience of YOU! Likewise, your personal brand experience is enriched by the power of the Soul-The Soul of your Brand. Your Personal Brand Experience is the microcosm of you and your world; and is thus, as unique and rare, as the Soul that nourishes and enriches the Brand YOU. The Experience of Brand YOU encompasses Your Brand Proposition, Your Brand Presentation and Your Brand Promise-honored. The Soul of Brand YOU is a beautiful mosaic of your Brand’s Values and Passions that present it a unique, rare and an iconic distinction over others. And the art of soulful introspection to discover the Soul of your personal brand is an experience in itself! Introspect and Identify 5-7 Values that you will never give up on: not even at gunpoint! These could be any aspect such as integrity, compassion, ambition, etc. which make you, YOU! Prioritize these Values on the basis of the importance they hold in your life today; remember, as we mature our values do grow and mature with us. Now, pick your top 3 values off the list; these are the top 3 dearest values of Brand YOU; the core fundamentals of your Brand. Identify your 2 deepest Passions that enthrall you beyond measure; the real sources of elation. Let one be your work passion-your work passions are often manifested in the form of brilliant milestones that adorn your professional journey; and the other your play passion-the thing that you love to indulge into after a washed out week. Strategize your Brand Statement- a brief one liner- using all or some of these 5 entities (your 3 values & 2 passions) that capture the essence of Brand YOU. Arrive at a word-just one word-that personifies this beautiful ensemble of your values, passions and the soul statement in one glorious word; this is the Soul of your Personal Brand. This is the Soul of Brand YOU, which draws the world to you. This is the source of an exclusive, rare and a truly iconic experience that your Brand offers to the world. This is the inspirational legacy, that you are about to confer upon this world. What is the Soul of Brand YOU: Share your Personal Brand Statement and/or the one word that personifies the Brand YOU! Comment below to share with us, to let the world celebrate the Brand YOU! 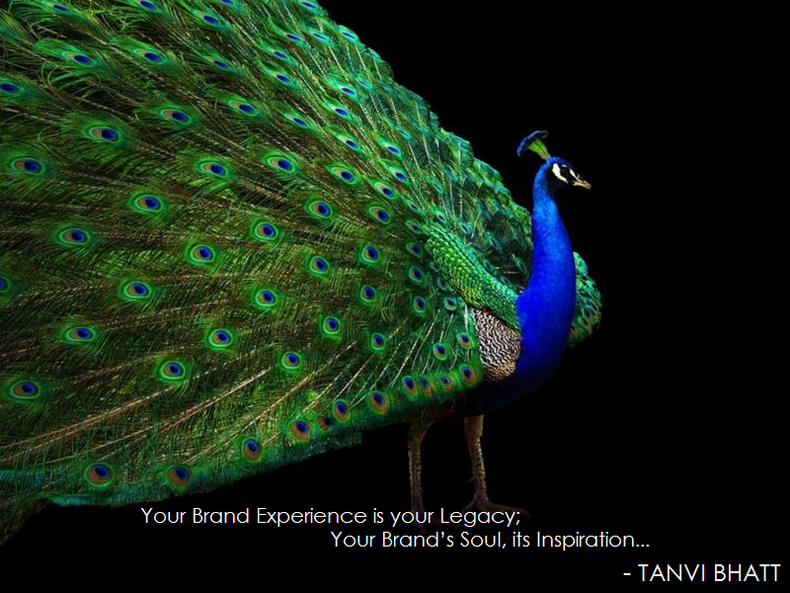 As the Pioneer of Personal Branding in India, Tanvi empowers Leaders to become Thought Leaders; Thought Leaders to become ICONS. Tanvi is India’s Leading Personal Brand Strategist and the founder and Managing Director of Panache. She is also a frequent speaker at diverse Industry Forums like the prestigious CII and PHD Chamber etc. and is the go-to personal branding expert for a portfolio of Indian as well as International MNCs such as The TATA Group, The Times Group, Mahindra, SAP, KPMG, Capgemini, HP, Parker, NTPC, OIL India Ltd, Ruchi Group, IDBI Bank etc. A young entrepreneur making waves in the Indian Corporate Society, Tanvi personifies the power of passion that empowers you to be yourself, to be Iconic.